Dr Livingstone I presume is the archetype of an explorer for most of us. The helmeted man at the head of the line of bearers fearlessly plunging into thick jungles to discover the world untouched by man. That is the way they write their histories, and that makes for the books that sell. Of course, most of us now realize that wherever Livingstone and his likes went, there was already a human population. In East Africa at the time, there was both the native population, and considerable numbers of Arabian businessmen to show the way to all the discoveries the British needed. And help finding lost explorers from time to time. The fact is probably that the major contribution of western explorers was the mapping of the continents. During the 18th and 19th Centuries maps were drawn like never before, and it was new maps, not one more round of Europe encircled by the edge of the world. The Center for the History of Science at the Royal Swedish Academy of Sciences is the guardian of enormous archives of objects, maps, drawings, and manuscripts that will eventually help toward understanding how our knowledge of the world gradually developed over the last few Centuries. The Center is highlighting some of its material as “object of the month”, since a few months back. One of these objects is a map sent to the Academy by Charles Andersson in 1852. It is a map made by Oswell and Livingstone based on interviews with local informants. Interestingly, this map of southern Africa from 1852 shows the Victoria Falls. The falls that, legend has it, Livingstone discovered in 1855. Not, he already had a map. 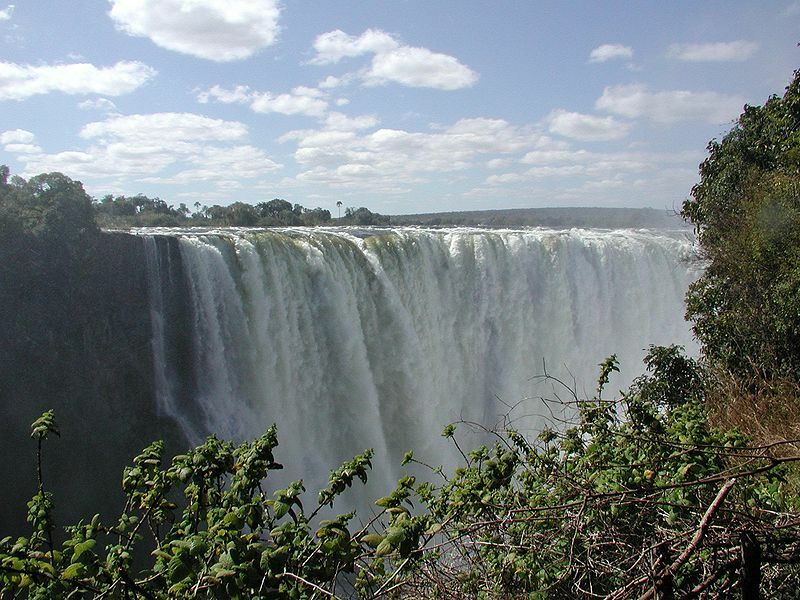 The local name of the falls is now rendered as Mosi-oa-Tunya, on the old map they appear as Mosioatunga. And who was Charles Andersson, by the way? Some may be familiar with Oreochromis andersonii. That is the fish named after him, but somehow, the author, Castelnau, misspelt the name by dropping one of the ses in Andersson. Karl Johan Andersson, Swedish,born 1827 in the county of Värmland, was the son of the English hunter and writer Llewellyn Lloyd and a Swedish girl, Caisa Andersdotter. Lloyd spent most of his adult life in Värmland hunting bears and writing about it. Karl studied Zoology at Lund University and learned taxidermy at the natural history museum in Göteborg. He somehow got the idea of going to the Africa, and stranded already in London he became a friend of a distant relative, Francis Galton, yes the very one who discovered the fingerprinting technique. Galton and Andersson went to Africa, and Andersson spent the rest of his life as a trader, hunter, collector and more in what is now Namibia and South Africa, and much of that time in the field. Andersson was not an ichthyologist. He did collect a lot of birds. Not less than 2523 bird specimens from him are in museum collections (Dean, Sandwidth & Milton, 2006). He sent 200 or more specimens to the Gothenburg museum in 1864, but the curator there didn’t bother to open the boxes. Andersson wrote a classical travel book, Lake Ngami, published 1856, based on travels including to Lake Ngami (already ‘discovered’ by Livingstone). His second travel book, Okavango River, from 1861, relates his own major discovery, the river of the same name. Or … did he discover it? Andersson’s zoological magnum opus, Notes on the birds of Damaraland, was published posthumously by John Henry Guerney in 1872. Andersson died of dysentery and physical wounds in 1867 on his way back from a failed expedition to the Cunene River on the border between Angola and Namibia. Andersson’s life is full of misery, hardships, diseases, fights with employees and local chiefs, and the one drawback after the other. The most disappointing must have been the search for Lake Ngami, only to find it already found. It is a miracle he survived so long. His companion Axel W. Eriksson (1846-1901), also Swedish, carried on the zoological collection and brought a huge collection of southern African birds to to Vänersborgs Museum in Western Sweden (available in an online database with images, all in Swedish). The consensus (remember the map above) must be that there is (and was) nothing to discover on this planet, really. That is why science is not so much about discovery. It is about exploration and communication. Showing what the world is like, drawing the maps and fitting the pieces together. Also, life can be much easier than that of Karl Johan Andersson. Bjelfvenstam, B. 1994. Charles John Andersson. Upptäckare Jägare Krigare. Carlssons Bokförlag, Stockholm, 253 pp. Posted in Biographies, Fish, Travel and tagged Africa, Charles John Andersson on 13 May 2011 by Sven Kullander. Among the most tragic of events in this world and our times are the deforestation and destruction of the world’s tropical rain forests, along with the conversion of the entire Amazon basin into temporary cattle ranching and soy bean plantations, South East Asia into margarine palms to tickle the well-being of health fanatics. And along with that cultures, languages, animals, and plants of immense significance for humanity and the well-being of the planet. It is an unbelievable erosion of capital, and a straight road to future devastation for the concerned countries. Just like we now also experience the demise of the oceans, and the loss of most natural biodiversity rich habitats already happened in North America, Europe, northern Asia, and much of Africa. Fortunately, we have the stories of those who were there, and the future will be able to sense from their writings the irrational passion of fish collection and jungle exploration, and at the same time the close encounter with the meaning of life. Iténez – River of Hope (English edition 2009) is the story of Amanda Bleher (1910-1991), a middle age, newly divorced woman in Frankfurt/Main, in the 1950s, running a pet business, earning her considerable reputation not least for importing snakes and crocodiles, a female Indiana Jones as e-jardim has it. The story focuses on her travel to Brazil in search of the discus fish (Symphysodon). Attempting to bring an American car from Germany, laden with four kids, pets, and all sorts of belongings, not least cosmetics, it is a road story with a lesser local vehicle of considerable inconvenience. Of course, there are no discus where she goes, heading for the Rio Iténez (Guaporé) on the border between Brazil and Bolivia. Love, trust, money, belongings, and belief in humanity evaporate along the way. Reaching the old Jesuit mission Vila Bela da Santíssima Trindade on the Iténez (Guaporé) River, there is considerable suffering in the tropical paradise, and with no money left, kids ill, and dubious friends failing, the dream of the Iténez has to be put back for realities for a while. Amanda eventually established a home and company near Rio, and travelled extensively afterwards, but this is the story you will want to read. To a rational mind planning a field trip, these 277 pages of continuous impulsive re-planning on the way may be frustrating. Why is she taking the kids? Why this amount of cosmetics in the interior of Mato Grosso? Why not check out the taxonomic literature for Symphysodon localities (Amazon mainstream)? Why follow the one after the other jungle whacko so desperately? Nonetheless, this is a fascinating story of travelling in the rain forest in those days when there was forest in Mato Grosso. It is a woman’s story, and thus different from male itineraries. It does not obviously have a hero (or heroine), and it is very truthful of all those things that go wrong, all those decisions that were not so smart it turns out, that the other stories never tell. It is also a rare verdict of passion, for the animals, plants, the rain forest itself, and the search for a new existence far away from war-stricken Germany. Was Amanda Bleher a spy sent by the Germans to check out the almost-deserted Vila Bela as Brazilians at times seemed to think? Is this book her coded report back? Besides the elusive discus, Amanda Bleher was mainly interested in getting water plants for aquariums, and this book gives a vivid insight into the early days of exploration of the Amazon for aquarium fishes and plants. Most of the history of exploration and travel is written by men. My bookshelves are laden with volumes by men discovering, exploring, and doing everything right. When I travel, it is never like that, it is always chaotic and frustrating all the time. The classical volumes of Ferreira, Humboldt and Bonpland, Castelnau, and Spix and von Martius, to mention the well-known, are faithful diaries, and there is much fact and information therein. But as literature they are boring. The Minister of the Interior lays before me all his maps — wonderful charts showing a Yungas dotted with prosperous little towns. The Department of the Yungas, by the way, is the transandine sub-tropical and tropical jungle which, with the Department of the Beni, stretches away off to the far borders of Brazil. “Who lives in these towns?” I ask the minister. How, then, does he know that the towns are there? He doesn’t. He shrugs with comical disgust and laughs. I would not consider bringing 50 kg of oatmeal in glass jars on trail and river from La Paz to Manaus. But perhaps cooking pots, lanterns, if I bring an outboard motor I would make sure there were gasoline for it, and of course scientific equipment. In White Waters and Black, you can read more about what to take and not to take. Women rarely go on expeditions, or they don’t write. Elizabeth Cabot Cary Agassiz (1822-1907) was an early exception, documenting the Thayer expedition to the Amazon (186-1867) led by her husband Louis Agassiz, but it is also a relatively dry itinerary interspersed with exclamative footnotes by Louis Agassiz, A Journey in Brazil (1868). Much more I appreciated Lady with a Spear (1951) by Eugenie Clark, an autobiography full of passion for collecting fish, part of the story of the post war atom bomb testing in the Marianas, and also testimony to the importance of having an aquarium in every home with children. To Dr. Günther, of the British Museum, I am deeply grateful for the kindness and interest he has always shown regarding all the specimens of natural history that I have been able to lay before him; the majority of which must have had very old tales to tell him. Yet his courtesy and attention gave me the thing a worker in any work most wants — the sense that the work was worth doing — and sent me back to work again with the knowledge that if these things interested a man like him, it was a more than sufficient reason for me to go on collecting them. That is a very kind acknowledgment, and Mary must have been a very nice person, who also made headlines when defending Africans and African cultures against Christan demonisation. Mary collected fish in the Ogowe River, and has some species named after her in recognition of her contribution to ichthyology. She worked all alone and on her own expense. I find that remarkable, given the obvious hardships, the absence of cars, roads, airplanes, air-condition, and bottled water that present-day explorers make good use of. Travels in West Africa is old enough to be in the public domain and can be downloaded from various sources such as Google Books. If you do not write down your story, it never happened. All books here are available from Amazon and other Internet books shops, except Iténez – River of Hope, to be ordered from AquaPress. Image Sven Kullander, CC-BY-NC. Posted in Biographies, Books, Fish, Travel and tagged Africa, Amada Bleher, books, collectors, Discus fish, Elizabeth Agassiz, Eugenie Clark, Gordon MacCreagh, Guaporé, Iténez, Mary Kingsley, Mulford Expedition, Pacific, South America on 20 July 2009 by Sven Kullander.